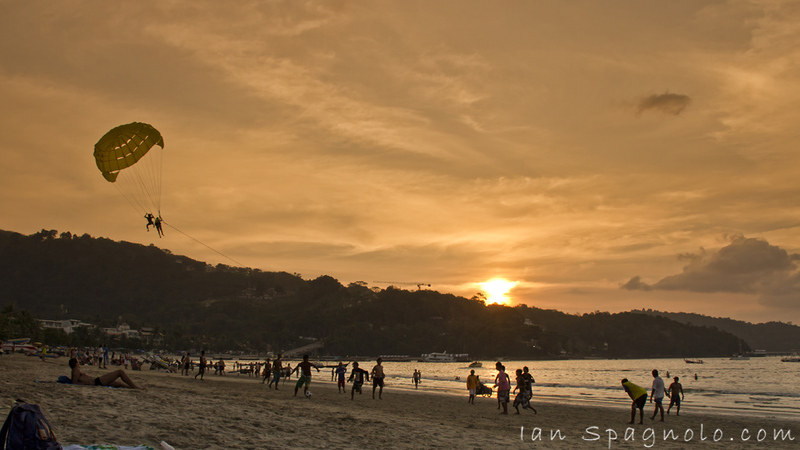 Sitting back watching the sunset over Patong beach, with the locals playing soccer on the beach, and a person parasails overhead. Finding a reliable internet connection proved to be a hassle while traveling, so I am going back to the start of my trip over the next few days and going though some photos. Our first stop was Phuket, where we stayed at Baan Laimai Beach Resort in Patong. While being in a great location opposite Patong Beach, the little touches make all the difference, and I don’t think I would stay here again with much better hotels close by – for just a little more cash. I would however recommend the food from the restaurant, and the live band was fantastic. There was plenty of shopping, catching up with friends from other trips to Phuket, lazing on the beach, and kicking back by the pool… what a way to start a holiday. We spent our last day in Phuket down at Karon, and witnessed a couple getting some wedding shots on sunset. It drew quite a crowd of onlookers, and a few saw it as an opportunity to borrow a reflector from the photographers for an impromptu model shoot… and I had to have a little laugh 🙂 I would imaging the wedding photographers got some great shots with such a beautiful sunset. Love that photo, Ian. I parasailed off Patong Beach last year. It was an amazing experience. 🙂 We stayed at the Club Med, which is great. I can’t wait to take this journey with you, it already has a fantastic beginning. And the private hideaway you stayed at? WOW ! Talk about lifestyles of the rich and famous. Rich and famous? I’m more famous than rich, and sometimes my own mother doesn’t even recognize me! hehe. Lets just say it was worth it. 🙂 I will have to do some more posts shortly on Thailand. Some nice shots Ian. Great image of Sunset over Patong beach. We stayed at the sunset beach resort on the northern end of patong beach for 5 nights.